I added this book to my to-read list shortly after it was republished in paperback in 2010. This is a novel that should be on your to-read list as well. But, maybe at a quiet/less busy time. This book is nearly 700 pages and is not what I would call a “quick read”. Our book club chose it for our August book and then had to move it into September as well after only one of our members was able to finish it in that month. I am hoping that others were able to finish it, because they are lots of great discussable topics! With so many pages, you know this isn’t going to be a fast-moving story. The writer takes his time by sharing history, detail, and gives great emphasis to the relationships in the story. At times, you are thinking, just get on with it. But most of the time, the detail is so beautiful and gives you a full picture of the moment he is sharing. There were so many pages that I dog-earred due to wonderful quotes in the book. Here are some of my favorites and give you an example of the style Verghese used in his story-telling. There were many other parts of the book that made an impression on me. I was fascinated and learned so much about Third World medicine. I was amazed at what the doctors could accomplish with so little. 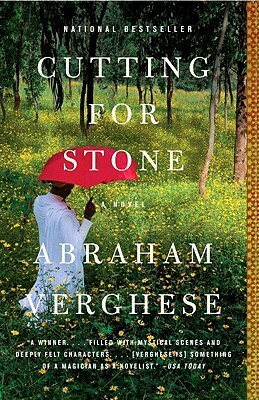 Death has such a different tone in Ethiopia rather than in America and within America between rich and poor hospitals and one I had never thought about before reading this book. There are so many discussable topics that this would be a great book club choice. I am looking forward to our discussion next week. I am sure we will hit on topics such as religion, forgiveness, grief, love, betrayal, and immigration. I give this 4 out of 5 stars and is a book that could be placed on a level with other classic literature. It should be read and talked about.